I have always loved pigs. I never tried pork so I don’t know if I love them as my food but I love their nose. I think they are cute. For some reason, fat pigs, basking in the sun, lying on the thick slime of a semi dried gutter always attracts my attention. The other day while returning from Mamta school, I saw a family of pigs sleeping in an overflowing gutter. Marinated (didn’t know of a better word to be used) in slime, the family was resting in the gutter. Right after watching D Day at PVR Saharaganj, I was heading home. There was a boggy patch, which looked close enough to being a gutter + dumping ground for all our wastes. A dog had enthroned the patch. Sitting upright with a salivating tongue, he seemed no less than an adorably hungry king of his colony. Two old men were sitting at the edge of patch, eating their meal. One day Son (my colleague) and I reached a particular session before time to check on some of our beneficiaries who hadn’t returned post their summer vacations. Walking past the shacks, we eventually came near a flowing water body. It was almost 4.30 pm and was scorching hot. On the other side of the water body we saw some submerged buffaloes. To be more precise, we saw half the head and the back side of those buffaloes. 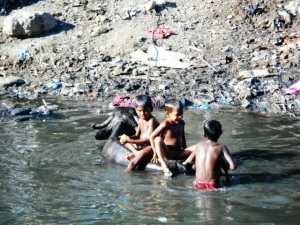 In less than a minute’s time, 2 kids came running down the slope on the other bank, kept one feet on a buffalo’s head, the next on its back side and splash! The next kid did the same. The kids were so happy splashing, swimming and splashing again, that Son and I immediately broke into a smile. Quite as a reflex action of a possessive individual, I quickly took out my camera to capture (possess) this moment of ‘my’ happiness. Within seconds, we were flocked by a set of curious residents, who, given Son’s north east looks, thought us to be some tourists. This caught those two boys’ attention too. Realizing our interest in them, they began posing for us and of course we did not stop clicking. Everything in this scene sounds picture perfect, unless you realize that this flowing water body is not a river but a high drain! I always had a bent towards the social development sector. As much as I wanted to work for the underprivileged, I also love indulging myself into shopping clothes, shoes and eating ice creams. As one of the NSS heads in college, I often got the privilege of attending or volunteering for things that the other girls couldn’t go for. So, one day we got a call from our teacher in charge that we would have to volunteer for giving Polio drops to children living in a slum in Delhi Cantt. I wore nice colourful clothes. Somehow I believe that colourful clothes make you more likeable by children and they will automatically cooperate with you. … all of this when I was only near a gutter and not inside it.